Headlies: Nailz Reconnects With Vince McMahon In Prison - WrestleCrap - The Very Worst of Pro Wrestling! Brooklyn, NY – During his brief stay at a Brooklyn jail, WWE CEO Vince McMahon reconnected with a former employee that he has not seen in almost twenty years. McMahon, who was initially placed under arrest for assaulting an NYPD police officer, was placed into a holding cell with other arrestees. Acknowledging the unspoken rules of prison life, McMahon understood that he would have to establish his dominance and take on the biggest prisoner. The 70 year-old loosened his tie and threw down his suit jacket as he approached a large man in an orange jumpsuit. “Listen, punk. 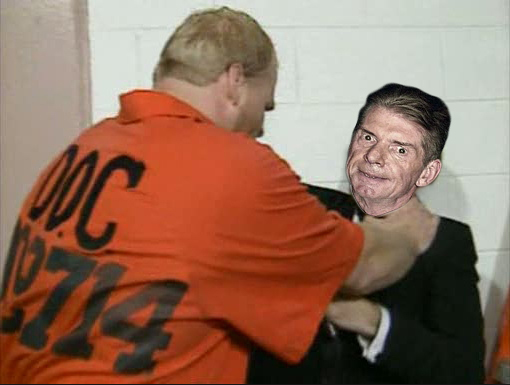 There’s going to be two hits: me hitting you twice,” said McMahon poking the prisoner in the chest. McMahon was taken aback by seeing the former WWF Superstar who once took on Virgil at Summerslam. “Ummm, how’s it going, pal? You’re looking…well. What’re you in for” said an uneasy McMahon. “Hey, that’s great, big guy!” said Vince, edging towards the cell door. “I know you’re getting out of here in a few minutes, but I’d like to give you a great, big hug before you go,” said Nailz, extending both his arms straight at McMahon’s throat. “N…no, that’s okay. I…I don’t…Guard! Nurse! Linda! Anyone! Help!” screamed McMahon. “Hey, quiet down in there!” shouted the guard. “The Mountie? What are you doing in here?” said a bewildered McMahon. “Remember when the Big Boss Man tossed me in here after the Jailhouse Match? I liked it so much, I decided to become a guard,” said The Mountie. “Can you get me out of here, pal?” pleaded McMahon. The Mountie then shocked McMahon with his cattle prod and carried McMahon’s limp body out of the cell. 5 Responses to "Headlies: Nailz Reconnects With Vince McMahon In Prison"
Vince soon regretted asking Nailz if he still had hard feelings over the end of his run in WWE. Nailz began to softly hum The Bossman’s theme, Hard Times to Mr. MacMan as Vince does his pattened “gulp face”. Very funny as always, Jordan! 2017: A Look Back In Horror – The Worst In Wrestling!